I recently received an e-mail from Brazil which was written in Portuguese. Although I couldn’t read it, I was able to figure out that it was about my Kaleidoscope Heart and Butterfly Molds. Since I don’t speak Portuguese, I went straight to Google Translate. 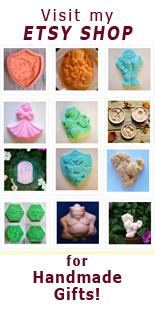 After several pleasant e-mails back and forth, I’d met Brazilian Baker Marilucy Ruppel and happily sent her molds off to her. I’m still a little amazed at how easy it was to connect with her, to talk about the molds and send them out to her. 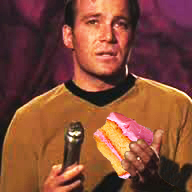 But it will be even easier next time, since amazing new devices and apps like World Lens and the Sigmo Voice Translator are well on their way to making Star Trek‘s Universal Translator a reality. I LOVE today’s technology! Eu recebi recentemente um e-mail do Brasil , que foi escrito em Português . Embora eu não pudesse lê-lo , eu era capaz de descobrir o que era o meu coração Caleidoscópio e Moldes Borboleta . Desde que eu não falo Português, fui direto para o Google Translate . Depois de várias agradáveis ​​e-mails e para trás, que eu conheci no Brasil Baker Marilucy Ruppel e felizmente enviou seus moldes fora dela. Eu ainda estou um pouco surpreso com o quão fácil era para se conectar com ela, para falar sobre os moldes e enviá-los para ela. Mas será ainda mais fácil da próxima vez, desde novos dispositivos e aplicativos incríveis , como Lens Mundial eo Sigmo Voice Translator estão bem no seu caminho para tornar tradutor de Star Trek Universal uma realidade. O amor de hoje a tecnologia! Goodbye Year of the Dragon (Part 2) Chantilly Dragons! 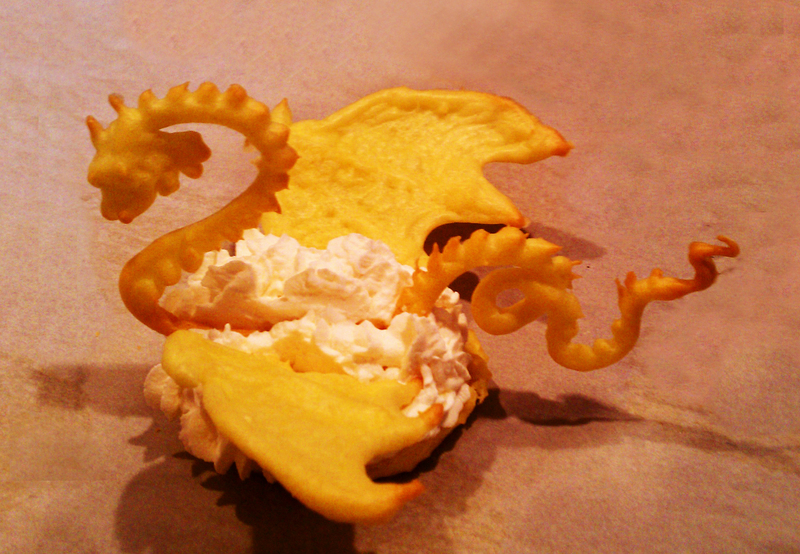 These Dragons may look tough, but they’re Creampuffs. These Dragons may look tough, but they’re Cream Puffs. 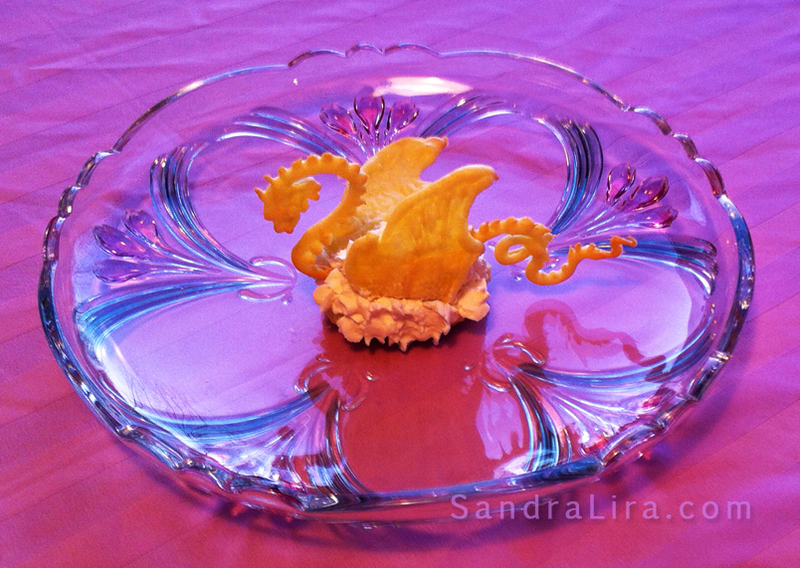 I usually post about ways to use ZANDA PANDA molds, but I just had to share this (sorry it’s a bit late for the Chinese New Year – I blame Blizzard Nemo 😉 ). I was smitten by an image of Chantilly Swans on Baking 101‘s Facebook page. It was posted by Wendy Gail from her Cinnamon Sweet Shoppe blog. — And of course I immediately thought of dragons. Her recipe, originally from Princess Cruise Lines, works very well, although next time I might add a bit of sugar to the choux pastry to sweeten the dragons up a bit. She has excellent instructions, so rather than repeat her recipe here, you can get it directly from Wendy’s blog and pop back if you want to make dragons. If you don’t already have them, I recommend picking up some tips (small round and medium star) and pastry bags , but you could use a zip lock bag with a corner snipped if you had to. 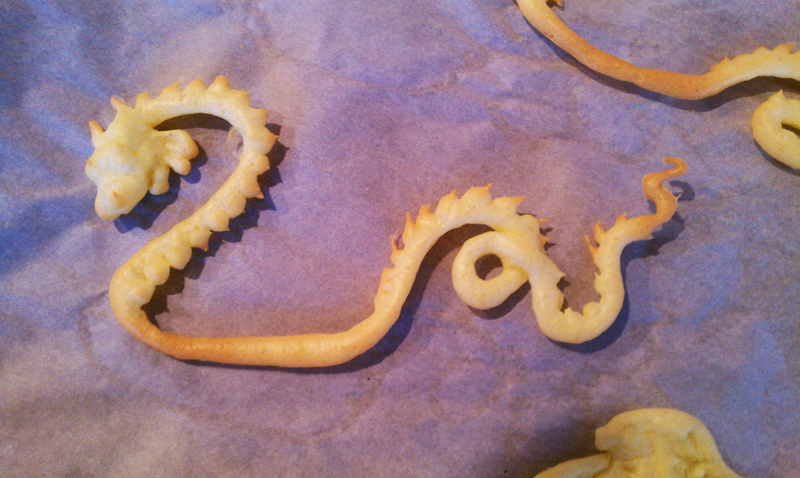 I piped and baked them on parchment/baking paper. I used a small round tip to make the ‘S’ shape as in Wendy’s instructions, but continued and added a looping tail. I switched to a smaller round tip and added nostrils, a brow ridge and eyes, ears and then scales down the spine and tail. I’m not the best at piping designs, but the batter is very forgiving and you can blend/smooth the shapes easily. Just remember, when piping, you’re not ‘drawing’ it onto the paper, you’re holding the tip just above the paper, guiding the line and letting it drop onto the paper in a flowing motion. Just practice a little and you’ll get it. To make the wings, I made the outline first, added ‘ribs’, then filled in between them in a zig-zag fashion. I then went over the ribs again and added claws at the tips. 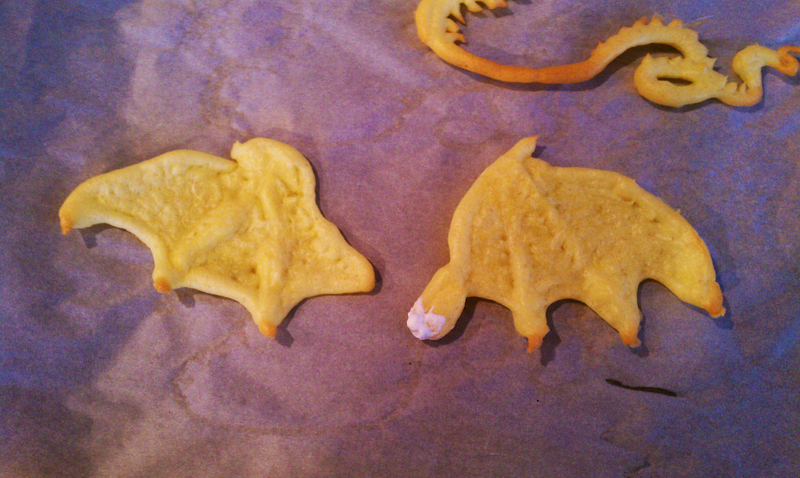 Don’t forget to extend the front of the wing a little, to press into the whipped cream. For the bodies, instead of a mound (for making swans), I started by coiling the batter for a base. Then I built up the sides to make a basket shape, with each layer just a bit wider than the one beneath it. Bake the heads and tails for about 5 minutes at 400°F. Reduce heat to 350°F and bake the bodies for an additional 5 minutes. 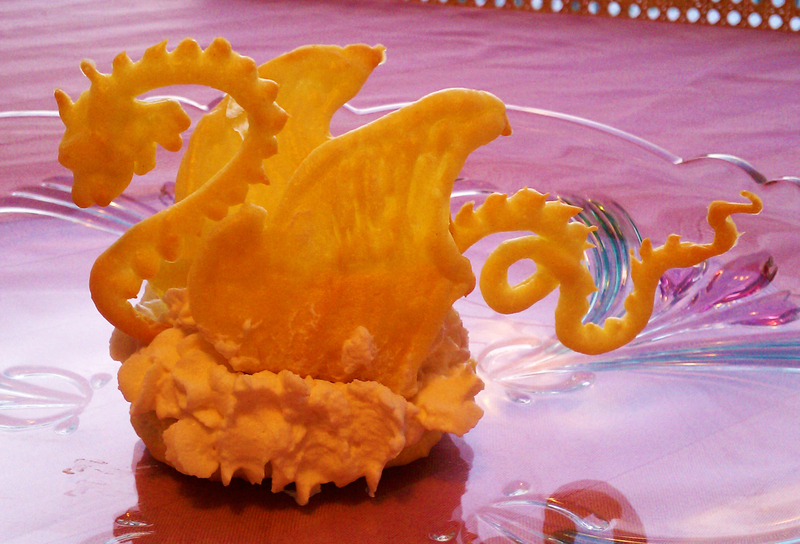 While the dragons are cooling, make the whipped cream. Using a star tip, pipe the whipped cream into the bodies. You can coil it or pipe it into little puffs (my favorite). You can also add fillings under or on top of the whipped cream, like berries, Nutella, chocolate, etc. Gently place the head and tail pieces into the whipped cream (if you’ve misjudged the length of the body, just break them into two separate pieces). You can add more whipped cream after placing them if needed. You should serve these soon after assembling them, especially if you made them large, as the whipped cream softens the pieces. They could begin to get droopy and sag a bit, making them look a little less majestic :). Or you could make them with their wings spread and not worry about it. Or make them like this (But add more whipped cream to the top after assembling). If you smush the whipped cream like this when assembling it, just add more rosettes on top of it. And for all of you GOT fans – as mentioned in the last post on Heather’s Khaleesi’s Dragon Cookies, these would be great for a Game of Thrones season premiere party next month! If you make these, please feel free to share your pics on the ZANDA PANDA Facebook page! You know the song, this mold needs no explanation 🙂 It’s a brand new design which will be shipping in late January. 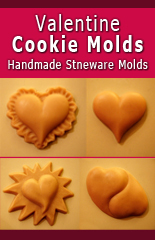 It joins my other five Valentine’s Day heart shaped cookie mold designs below. The cookie above had a light orange flavor, I spread a thick layer of dark Ghiradelli chocolate on the back. It was a delicious combination that reminded me a little of Pepperidge Farms’ Milano Cookies. I’ll post the recipe soon. You can find more info on the new design in my Etsy shop. For more info on the five Valentine Heart Molds below, please visit the ZANDA PANDA website. For the hopeless romantic in you. 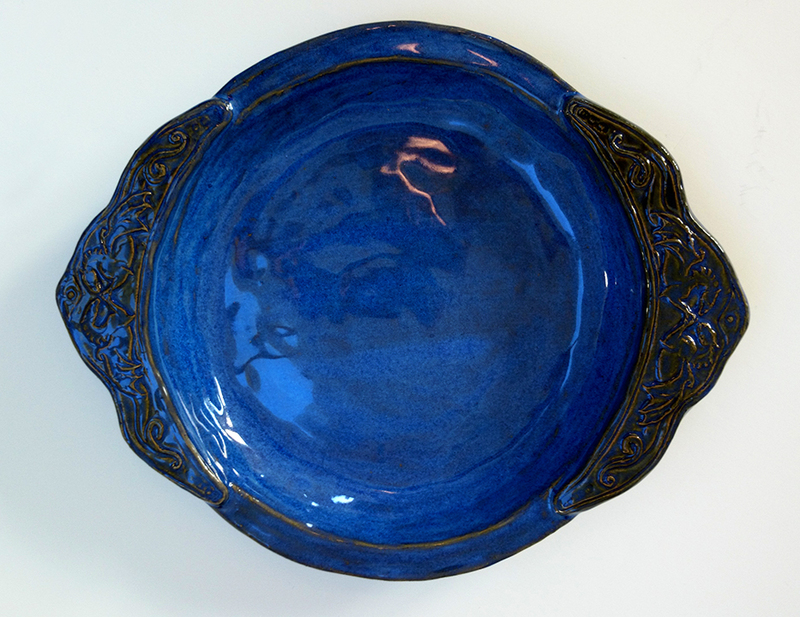 2.5″ high No frills, true-blue traditional heart. 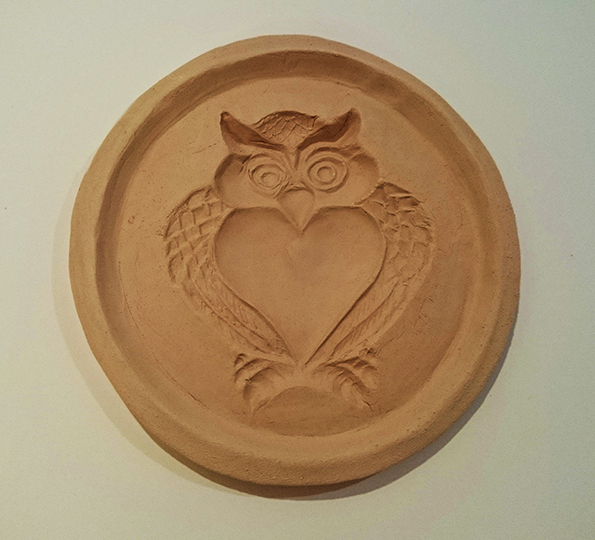 2.25″ high Who sets your heart afire? 2.5″ high Is your sweetie Yin to your Yang? Then you already know opposites attract! 3.5″ wide When love hits you like a lightning bolt! 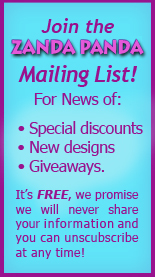 BTW, if you’re on my mailing list, watch for an e-mail by early February! (it’s free, I will never share your info and you can unsubscribe at any time).